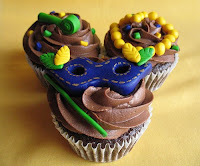 The Tuesday prior to the Lenten season, is considered, FAT TUESDAY. The day we just fatten ourselves up for our Lenten sacrifice... I was on Flickr today and saw some amazing pictures of some gals going after their Marti Gras beads. Didn't they know that all they had to do was just go out a buy some prior to the parade? Or am I just being naive?